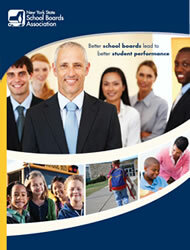 Membership in the New York State School Boards Association is open to all public school boards and boards of cooperative educational services (BOCES) in New York. NYSSBA provides member boards with skill building and informative education programs, publications and consultant services. Many of these events and services are free to members. NYSSBA represents the views of members with education policymakers in Albany and Washington, D.C. Our advocacy efforts are directed by the membership through an annual resolutions process and business meeting in October. Adopted resolutions become the positions that form NYSSBA’s legislative agenda. NYSSBA also assists members with legal questions, negotiations advice, policy guidance, communications activities, research needs and much more. If you would like additional information regarding membership, please contact Michael Bieber, Member Relations Manager, or Patrick Longo, Member Relations Manager, via email or by calling (518) 783-0200.